Kaiser Permanente, formerly Group Health, has a large presence in the Northwest. The medical facility benefits over 651,000 people in Washington State. Their Bellevue location received Hospital Compactors from Sani-Tech in 2010. Together with the hospital, we decided on manufacturing two Auger Compactors, Models ST1040/30 and ST1046/36. Designed for hospital recycling of cardboard and bulky material compacting, our machines are the most beneficial to any business! Your hospitals carbon footprint is reduced when using a Sani-Tech Auger Compactor. The Commercial Compactor has our all-electric rotary drive and eliminates the use of hydraulic compactor fluid, along with the risk of contamination, line breaks, leaks and filters. Our all-electric approach means your machines produce zero emissions and run quietly. This ensures your patients, staff, and communities near the hospital are not disturbed. Attached to these Auger Compactors are Sani-Tech Bins. 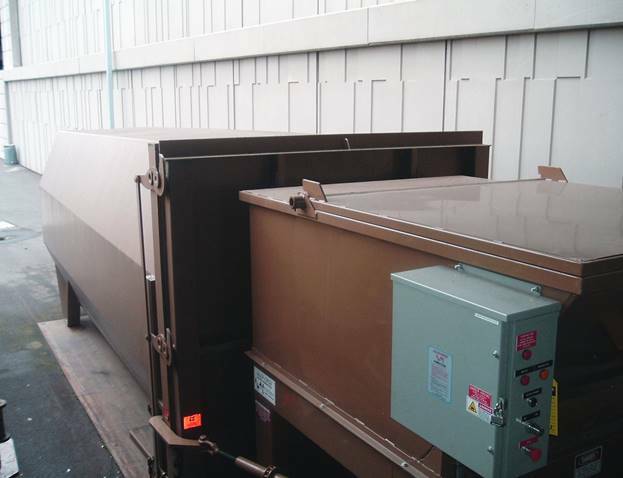 Our bin sizes range from 15 - 23 feet with a capacity ranging from 10 - 47 cubic yards. Sani-Tech System custom builds to suit any hospital's needs! We’re excited to see what Group Health becomes with the new ownership of Kaiser Permanente, and are proud to say the Auger Compactors installed over 7 years ago are running strong today. Sani-Tech Auger Compactors are built custom to each application and are made to last!